When we moved to Houston last year, my husband knew his new position was going to be a challenge. The new system that his company is implementing will "go live" this month. We are all grounded here for Easter and won't be traveling home for the holiday. He and his team will be working hard once they turn on the new system preparing for any snaffoos that may arise. We're going to create our own Easter holidays at home. I brought out all of my Easter decorations and had fun introducing them to a new house. I saw these little chocolate bunnies and couldn't resist treating everyone to a little pre-holiday taste. I am continuing to soak up as many episodes of "Take Home Chef" as I can squeeze in our homeschooling schedule. Did I mention in my previous articles that it is hosted by this adorable Australian Chef Curtis Stone? He chose the cutest woman on this one episode to create a dinner for her and her husband. Her name was Elena and she was from Russia. She was sweet and soft spoken and a tad shy. She had an amazing garden in her yard and Curtis used so many fresh ingredients from it to create his meal. 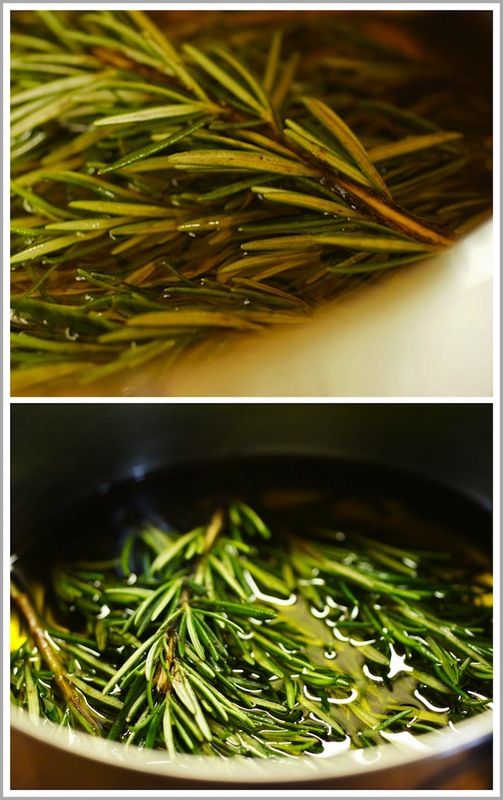 The dish calls for a home made rosemary oil. This was so much fun to make. 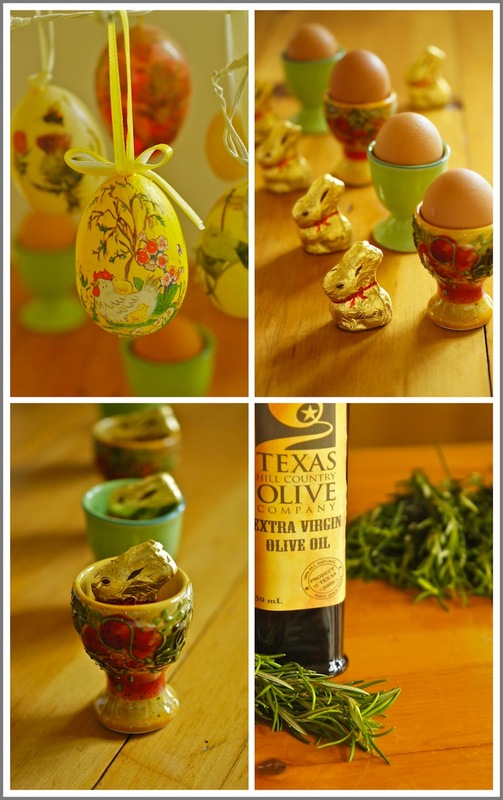 Do you remember that Texas Olive Oil that I bought a few weeks ago at the farmer's market? Well, I decided to use that bottle. The rosemary is pounded to release the flavor. Then, it is soaked in a pot of olive oil at a light simmer. Once the mixture sits for several hours the rosemary is removed and the oil is again bottled. This certainly made the house come alive with an enticing aroma. My curious family wandered through the kitchen wondering about this new endeavor. I wish I could go outside and snip stalks of rosemary growing wild like they did in L.A. I do have my own rosemary but it wasn't enough to make this oil. I don't know if there is anything that smells so wonderfully aromatic as rosemary and olive oil. Hooray for the person who decided to squeeze olives and smash rosemary way back in the stone age. Again, a shameless plug for Williams-Sonoma. Honestly, I really should ask if I could have one of those W&S Ad badges for my blog. I love that store! In my last cooking class, they used a mandoline several times. The other people in the class seem more experienced than me and they all swore by the mandoline in the store. Put it on my tab! I'm milking that 10% discount for all its worth. I had a wee bit too much fun and could have sliced away with my new toy. Last week I used it on my potatoes au gratin. This week zucchini!! I also did some garlic mashed potatoes (using this mandoline) to go with this fish dish but I'll write about that in tomorrow's article. Once I had my individual cod fish portions wrapped and seasoned with salt and pepper, I brushed some of that sensuous rosemary oil over them. Here is where I ran into a bit of a stumble. 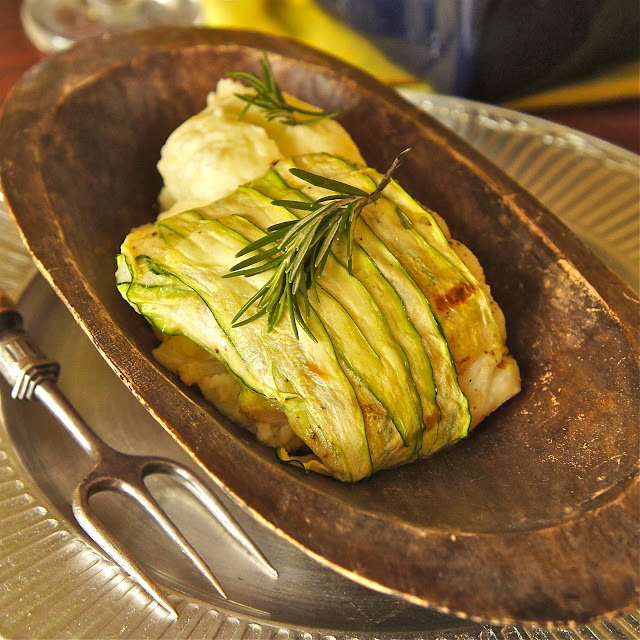 The recipe calls for lightly searing the zucchini wrapped fish in a pan before putting them in the oven. My zucchini started to fall apart. I couldn't seem to get the temperature just right. Then, I tried to flip them. At this point, a bit of steam started shooting out of my ears. Hmmm...not working like Curtis demonstrated in front of Elena. Darn professionals! I ended up putting the pan directly in the oven to cook the fish. Then, right at the end, I moved my pan under the broiler so they would get that golden color. This worked splendidly. I felt a twinge of pride in my impromptu skills but still would have liked to flip them like a pro. This was a delicious and healthy dinner choice for this weekend. We don't really eat enough seafood because I don't feel confident cooking it so this was another attempt to improve my culinary skills and eat a healthier diet. Sunday is our one day a week to completely unwind. Between my husband's project demands, M's college prep studies, R.'s increasingly growing schedule, we never schedule anything on Sunday. I either have a glass of red wine in hand or a hot cup of coffee (still enjoying my Cafe du Monde brew) and in the kitchen is where you will find me. We are still getting used to the incredible Spring weather so early in the year. April for goodness sake! 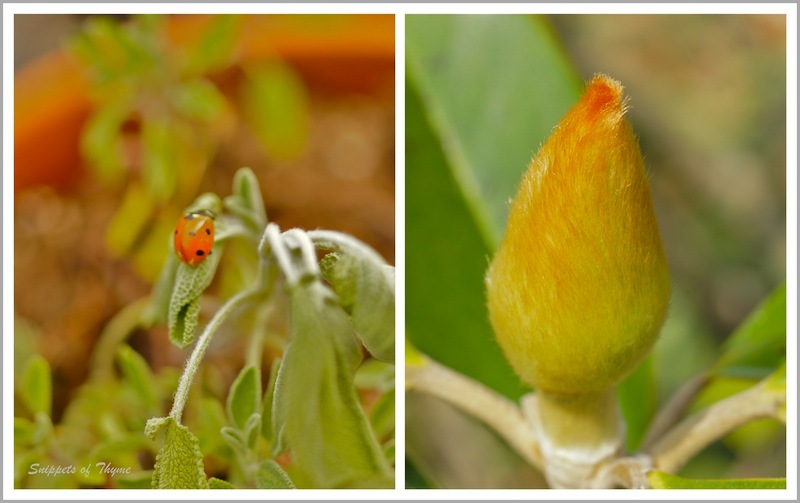 We have been in colder climates for so long, its amazing to see lush grass, flickering ladybugs, and bulging magnolia buds readying to bloom. 'Til next Sunday! Let the craziness of the week resume. We're ready for it. Using the back of a large chef knife, bruise the rosemary as much as possible. Place the bruised rosemary in a small saucepan with the extra virgin olive oil and gently warm the oil over medium-low heat for about 5 minutes or just until it is lukewarm. Reserve the olive oil bottle. Preheat the oven to 400°F/205°C. Sprinkle the fish with salt and pepper. (Sarah's note: Cod is VERY mild so season it really well to bring out some flavor) Lay about 6 zucchini slices horizontally on the work surface to overlap each other slightly and create a 5x7-inch/13x18-cm rectangle. 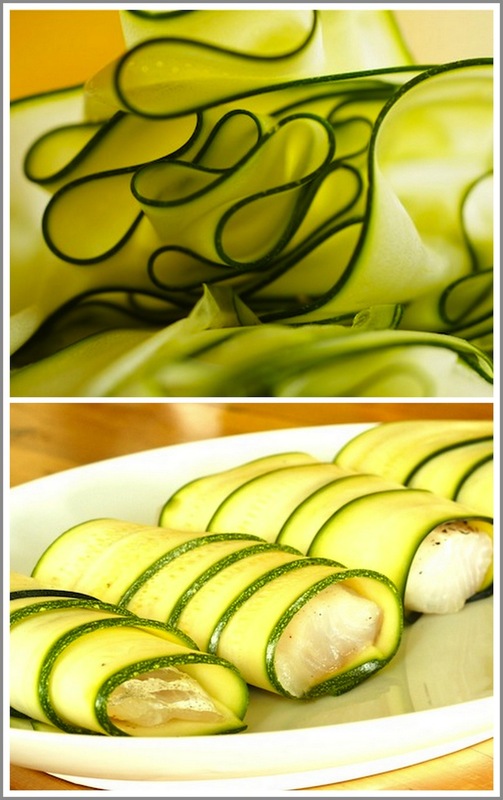 Place 1 black cod filet on top of the zucchini slices and wrap the zucchini around the fish to cover completely. Add 4 sprigs of rosemary to the pan (Sarah's note: soak these before hand or they will burn in the oven) (these will be used for garnish). Transfer the pan to the oven and bake the fish for about 8 minutes (the time will depend on the thickness of the filet), or until the fish is just cooked through. Drizzle 1 tablespoon/15 ml of the rosemary oil around the plates. Garnish with the roasted rosemary sprigs and serve. 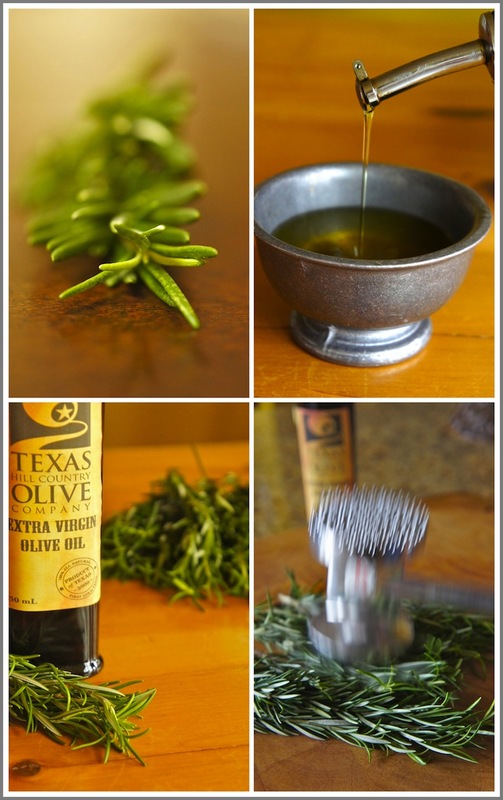 Pour the remaining rosemary oil into the reserved olive oil bottle, discarding the rosemary sprigs, and reserve the oil for another use.